Yale is one of the world's pre-eminent scientific research institutions, with state-of-the-art facilities and top lab teams located on all three of Yale's campuses: Central, Medical and West. Graduate students have access to research projects that span every dimension from biophysical analysis of single molecules to charting entire galaxies, from fundamental questions in biology to the latest innovation in carbon fixation. Research at Yale is highly collaborative allowing graduate students to develop as interdisciplinary scientists. Yale has invested over $1.5 billion in science facilities, including major renovations of teaching and research facilities in Chemistry and Physics, and the Yale Quantum Institute. 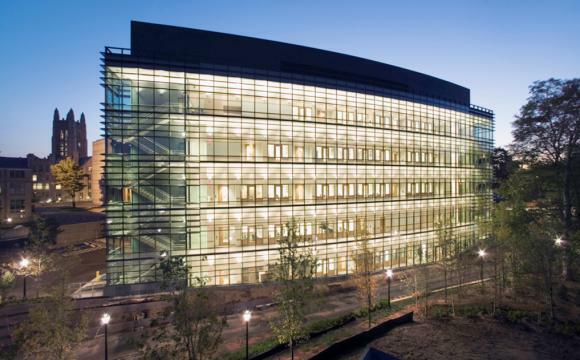 The newest project is the 240,000 square foot Yale Science Building (YSB) scheduled to open in 2020 with an integrated community of researchers in biology, botany, chemistry, physics, engineering and math. YSB will also have the largest auditorium on campus and plenty of gathering spaces for conversations about the next exciting interdisciplinary idea. For humanists and social scientists, Yale is the place to be with libraries, galleries, collections, and other facilities that provide extraordinary research opportunities (and wonderful browsing). The library system has more than 15 million volumes and maintains significant holdings ranging from ancient Babylonian artifacts to contemporary periodicals. The special collections include written material of every kind: rare books and manuscripts, ancient clay tablets, posters, even greeting cards. Beyond the written word, Yale has extensive collections of maps, photographs, sound and video recordings, coins, and other items of great cultural and historical importance. The Beinecke Rare Book and Manuscript Library houses a vast collection of hand-written and printed materials, including ancient papyri, medieval illuminated manuscripts, photographs, and the correspondence of hundreds of major literary and historical figures. The Yale University Art Gallery has more than 200,000 objects from around the world, dating from ancient Egyptian times to the present. The Yale Center for British Art houses the most comprehensive collection of British paintings, prints, drawings, rare books, and sculpture outside Great Britain. The Peabody Museum at Yale advances our understanding of earth's history through geological, biological, and anthropological research. Our professors are more than world-class educators, scholars, and scientists: they are true mentors. Yale's faculty is brilliant. Their research has been ground-breaking in every field, and they routinely win major awards that acknowledge their original contributions. Our scholars and scientists are also great teachers and outstanding mentors. Every year, the Graduate School honors professors whose teaching inspires and enlightens, and who dedicate themselves to the academic, professional, and personal well-being of their students. Yale offers comprehensive financial packages for all Ph.D. students for a minimum of five years, and some students are eligible for a sixth year of funding. Most science students are funded for the duration of their study, irrespective of its length of time. The financial aid package includes a full tuition fellowship, an annual stipend, and comprehensive health care coverage. In 2019-2020, the minimum stipend is $31,800 - more than the estimated cost of living in New Haven for a year. Yale provides generous support for Ph.D. students with children to help students with families combine parenting with completing graduate school. We provide one semester of parental relief per birth or adoption with a full stipend. The academic clock is stopped during this time making it an extra semester of funding. We cover the fees at Yale Health for students and their children and offer partial support for spouses. In addition, our Family Support policy provides students with children $4700 per year, which they can use to cover spousal health insurance, childcare or any other family expense. Yale graduate students have a strong, effective student government that reviews and recommends Graduate School policies. The Graduate Student Assembly consists of 64 student representatives, one from each department or program, elected by their peers to present students' concerns to the administration. The GSA reviews policy decisions, and its recommendations are taken seriously. The Graduate School provides $120,000 in Conference Travel Fellowships that the GSA awards annually to enable students to attend academic meetings. Yale gives outstanding pre-professional training to students seeking both academic and non-academic careers. Learning to teach is a fundamental part of graduate education. At Yale, students develop teaching skills, under faculty guidance, by serving as teaching fellows for undergraduate sections, labs, and classes. Additional training is provided by the Poorvu Yale Center for Teaching and Learning. Teaching requirements vary by department or program, but are normally for two to four semesters during years two through four. In addition to pedagogical training, the Graduate School offers fellowships in its museums and collections for those interested in considering curatorial, library, or research careers. The time commitment for either kind of fellowship ranges from 10 to 20 hours a week. Yale helps graduating students launch their careers, both in and outside of academia. Every department has a designated faculty member to guide and assist students entering the job market. The Graduate School's dossier service acts on behalf of students from their first job to their retirement. The Office of Career Strategy has staff devoted specifically to helping graduate students with every aspect of the job search, including CV and resume preparation, practice interviews, and networking opportunities with Yale's extraordinary alumni. The Graduate School Alumni Association hosts “Where do I go from Yale?” every year, featuring successful alumni from all walks of life. Yale is a really fun place to be! Yale is a really fun place to be. Sure, you'll work hard and accomplish a lot. But you can also have a great time on campus. Check out the free “First Friday at Five” happy hours, hosted by the McDougal Graduate Student Center. Want to dance the tango, play rugby, train for a triathlon, sing a capella, learn calligraphy, or get together with people who share your ethnic, cultural or religious background? Easily done. Clubs for these and many other activities are there for you. And you can always launch a new affinity group, with support from the Graduate School. In addition, students get free membership to Payne Whitney Gym, free tickets to Yale home games, free use of the Yale shuttle buses, free entrance to Yale's museums, and invitations to lots of (free) lectures, receptions, films, and more. New Haven is amazing. Don't let anyone tell you otherwise. Located midway between New York City and Boston, New Haven has excellent shopping, bookstores, coffee shops, clubs, movies, and live theater, all within an easy walk of campus. Because of its 100+ great restaurants, Livability.com called New Haven “the nation's number one spot for foodies.” The city is alive with activity, both on and off campus. During Open Studios in the fall, over 200 local artists invite visitors to see where they work. At the International Festival of Arts & Ideas in June, you can enjoy performances of every kind - from Shakespeare to African drumming. Free pop and jazz concerts draw crowds to the New Haven Green on summer weekends, and in August, the New Haven Open at Yale brings some of the world's best tennis players to town.